By Ben Gardiner and Jackson Runkle · Sept. 17, 2015, 8:09 p.m. 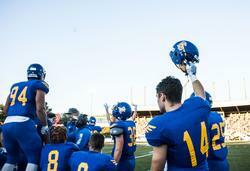 The first football game on home turf is truly emblematic of the Thunderbird spirit that lasts throughout the year. UBC had the perfect game day setup. By Ben Gardiner and Jackson Runkle · Nov. 17, 2015, 8:33 p.m. The UBC men’s basketball team continued to show their offensive muscle this weekend, sweeping the Trinity Western University Spartans 94-69 on Friday and 85-75 on Saturday. By Ben Gardiner and Ben Gardiner and Jackson Runkle · March 18, 2016, 4:25 a.m.
UBC started the game strong, up 8-2 in the opening minutes. 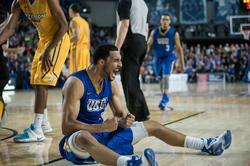 Buoyed by an emphatic dunk from Conor Morgan, UBC was up 14-7 at the five minute mark in the opening frame. The ’Birds played some of their best defence of the season in the first quarter. By Ben Gardiner and Jackson Runkle · March 18, 2016, 8:24 a.m. 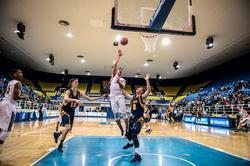 Despite their best performance of the year, the Thunderbirds men’s basketball team lost in overtime to the first-seeded Ryerson University Rams on Thursday evening. 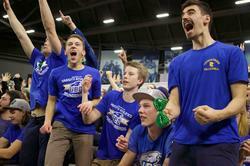 UBC had not hosted the men’s basketball National Championship in 44 years. By Ben Gardiner and Jackson Runkle · March 19, 2016, 7:25 a.m. 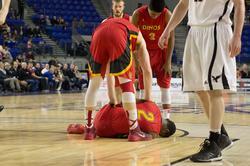 Following a tough loss to Ryerson the previous evening, UBC beat the fifth-seeded McGill University Redmen 69-68 in the consolation B game and will now be fighting for fifth place in the CIS men’s Final 8 national basketball tournament. By Ben Gardiner and Jackson Runkle · March 21, 2016, 9:13 p.m.